Shyly I walked into Radhanath Swami’s room and occupied a corner. Radhanath Swami, sitting relaxed on a rocking chair at the other end, beckoned me to come closer. And I sat closer. I had joined the monastery a few weeks ago. Being insisted upon by a senior monk, I was here, in Radhanath Swami’s room. The monk had intended to make me feel at home. Yes, now experiencing the gentle smile of the Swami, I felt at home. “I serve guests who visit our monastery.” I replied. I went on to explain how I liked the service, and the challenges I faced while serving. As I rambled on, at one point Radhanath Swami’s expression grew yucky, as if a stinky sewer had just burst open. I paused. Did I speak something which I wasn’t supposed to speak? In a flash I realized. Inadvertently, I had criticized a guest. Diverging to another topic, I saved my skin. 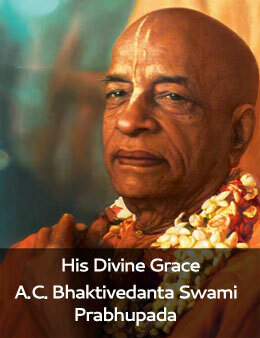 I had heard from many that Radhanath Swami hates to speak or hear the criticism of anybody. Today I had gained a first hand experience. Fault finding & criticising others are two of the biggest impediments on the spiritual path of self-realization. Thank you Radhanath Swami for emphasizing on this fact through this incident. Criticism is an enemy within all of us…. we should get rid of it…. HHRSM ki jai. Thank u so much sharing. Radhanath swami is a genuine follower of Sri Caitanya Mahaprabhu! Radhanath swami truly has love and compassion for everyone! Very wonderful quality of Radhanath Swami shown in this nice article. Very inspiring article. Thank you so much for sharing. Hare Krishna. Thanks for sharing. Maharaj…you’ve always shown us the virtue of righteousness through your example. Thank you for sharing . Hare Krsna ! Thanks for sharing such a beautiful anecdote with Radhanath Swami ! HH Radhanath Swami always teaches us not to hate. He sows love in our hearts though we try to justify our hatred for nondevotees. As maharaj teaches, bhakti yoga is all about loving everybody. Thank you very much. His Holiness Radhanath Swami has shown the perfect example of how we should lead a life without criticizing others. Thanks for sharing. wonderful article. H.H.RadhanathSwamiji shows by his examples the love for everyone.within our hearts. Radhanath Swami is teaching here us from his personal example how to hate criticism! Thank you very much Radhanath Swami for this.